Free Shipping Included! 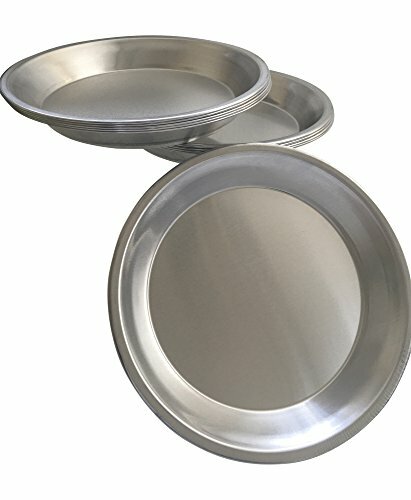 Pie Plate Aluminum Metal 9 Inch pan - Set of 10 by Chicago Metallic at My Beautiful Cake. MPN: unknown. Hurry! Limited time offer. Offer valid only while supplies last. MATERIAL: Aluminum. This easy to clean aluminum pie pan is ideal for a variety of pies from blueberry and country apple to key lime, lemon meringue or your favorite savory chicken pot pie recipe! DESIGN: Symmetrical in shape, the raised and slanted edges allow your flaky, crispy or crunchy crust to hold its shape beautifully! CARE: To preserve the quality of these pans, it is recommended they only be hand-washed. MADE IN AMERICA: Gift a loved one a homemade pie in these Made in America pans! TECHNICAL SPECS: Depth: 1 1/8". Top Diameter: 8 7/8". Bottom Diameter: 7 3/16".